Guard::Jasmine automatically tests your Jasmine specs when files are modified. Tested on MRI Ruby 1.9.3, 2.0.0, 2.0.1 and the latest versions of JRuby and Rubinius. If you have any questions please join us on our Google group or on #guard (irc.freenode.net). Continuous testing based on file modifications by Guard, manifold configuration by writing rules with RegExp and Ruby. Fast headless testing on PhantomJS, a full featured WebKit browser with native support for various web standards: DOM handling, CSS selector, JSON, Canvas, and SVG. Runs the standard Jasmine test runner, which can optionally integrate Jasmine into the Rails asset pipeline, enabling you to write your specs in CoffeeScript. Integrates Istanbul to instrument your code in the asset pipeline and generate coverage reports. Can be used to run Jasmine-species acceptance tests provided by Jasmine Stories. Thor and Rake command line helper for CI server integration. Runs on Mac OS X, Linux and Windows. The simplest way to install Guard is to use Bundler. Please make sure to have Guard installed. Please have a look at the CHANGELOG when upgrading to a newer Guard::Jasmine version. You need the PhantomJS browser installed on your system. You can download binaries for Mac OS X and Windows from the PhantomJS download section. You can also build it from source for several other operating systems, please consult the PhantomJS build instructions. Guard::Jasmine will start a Rails Rack server to run your specs. Step by step instructions on configuring this are below. Guard is triggered by a file modification. Guard::Jasmine executes the PhantomJS script. The PhantomJS script requests the Jasmine test runner via HTTP. Rails uses the asset pipeline to get the Jasmine runner, the code to be tested and the specs. The asset pipeline prepares the assets, compiles the CoffeeScripts if necessary. The asset pipeline has finished to prepare the needed assets. Rails returns the Jasmine runner HTML. PhantomJS requests linked assets and runs the Jasmine tests headless. The PhantomJS script collects the Jasmine runner results and returns a JSON report. Guard::Jasmine reports the results to the console and system notifications. Configuring Guard Jasmine to integrate with the asset pipeline. Guard::Jasmine can be adapted to all kind of projects. Please read the Guard documentation for more information about the Guardfile DSL. port:  8888                                   # Jasmine server port to use. Note that some ports (e.g. 6665) won't work. # This is due to the fact that Webkit considers them unsafe. phantomjs_bin:  '~/bin/phantomjs'             # Path to phantomjs. timeout:  20                                  # The time in seconds to wait for the spec runner to finish. rackup_config:  'spec/dummy/config.ru'        # Path to rackup config file (i.e. for webrick, mongrel, thin, unicorn, puma). jasmine_url:  'http://192.168.1.5:1234/jasmine'  # URL where Jasmine is served. You may want to have also a fixed port instead of the random generated one. If you supply an unknown server name as the :server option, then Guard::Jasmine will execute a rake task with the given server name as task in a child process. For example, if you configure server: 'start_my_server', then the command rake start_my_server will be executed and you have to make sure the server starts on the port that you can get from the JASMINE_PORT environment variable. spec_dir:  'app/spec'                         # Directory with the Jasmine specs. clean:  false                                 # Clean the spec list by only keep Jasmine specs within the project. all_on_start:  false                          # Run all suites on start. keep_failed:  false                           # Keep failed suites and add them to the next run again. The :keep_failed failed option remembers failed suites and not failed specs. The reason for this decision is to avoid additional round trip time to request the Jasmine test runner for each single spec, which is mostly more expensive than running a whole suite. In general you want to leave the :clean flag on, which ensures that only Jasmine specs (files ending with _spec.js, _spec.coffee and _spec.js.coffee inside your project are passed to the runner. If you have a custom project structure or spec naming convention, you can set :clean to false to skip that file filter. # at least one spec fails. With the option set to :always, the specdoc is shown with and without errors in your spec, whereas on with the option set to :never, there is no output at all, instead just a summary of the spec run is shown. The default option :failure shows the specdoc when at least one spec failed. When :focus is enabled, only the failing specs are shown in the specdoc when at least one spec is failing. You may want to have different options when the spec runner runs all specs. You can specify the :run_all option as a Hash that contains any valid runner option and will overwrite the general options. toJSON() - must return an object that is used instead of the actual object. In addition, the console can log jQuery collections and outputs the HTML representation of the element by using the jQuery html() method. Istanbul needs to instrument the implementation files so that the execution path can be detected. Guard::Jasmine comes with a tilt template that generates instrumented implementation files when using in the asset pipeline. If you do not use asset pipeline, than you need to instrument your files on your own, either manually (basic example: istanbul instrument --output instrumented_scripts scripts) or by using something like Guard::Process. You can get more information about the instrumentation with istanbul help instrument. You'll also need to update your :spec_dir or jasmine.yml/src_dir settings to point Guard::Jasmine to these instrumented source files. A positive threshold is taken to be the minimum percentage required, a negative threshold represents the maximum number of uncovered entities allowed. The :coverage_summary options disables the detailed file based coverage report by a small summary coverage report. Both of these results are more useful if they are run against the coverage data from a full spec run, so it's strongly advised to enable the :all_on_start option. With Jasmine in the asset pipeline all instrumented implementation files are available in the runtime and when you execute a partial spec run it reports a lower coverage for the excluded files, since their associated specs aren't run. Guard::Jasmine tries to work around this by merge only the coverage data for the changed files (Istanbul knows the file name in opposite to Jasmine). # Run Jasmine tests with code coverage on and generate Jenkins-compatible Jasmine code coverage report file. # Must run assets:clean first to force re-compilation. # Make sure to fail this task if there are unit test failures. # For some reason does not work if run as separate exec's, so combine into one. notification: false                           # Show success and error notifications. hide_success: true                            # Disable successful spec run notification. max_error_notify: 5                           # Maximum error notifications to show. Jasmine doesn't know anything about your test files, it only knows the name of your specs that you specify in the describe function. When a file change is detected, Guard::Jasmine extracts the first spec name of the file and uses that spec description as spec filter. Use only one top-level description per spec file. Make each top-level description unique. To get a feeling how your naming strategy works, play with the web based Jasmine runner and modify the spec query parameter. Guard::Jasmine includes a little command line utility to run your specs once and output the specdoc to the console. -e, [--server-env=SERVER_ENV]         # The server environment to use, for example `development`, `test` etc. Tip: It's highly recommended the have a server timeout of at least 60 seconds, since the performance of the Travis VMs seems to vary quite a bit; sometimes the Jasmine server starts in 5 seconds, sometimes it takes as long as 50 seconds. When building an engine, your code lives at the root but the dummy Rails app is in another folder (like test/dummy or spec/dummy). Rails 5 ships with a puma configuration that may conflict with Guard Jasmine if they're both running concurrently. To work around this, the tmp_restart plugin in config/puma.rb needs to be disabled for development mode. guard-konacha, Automatically run konacha tests through Guard. You can report issues and feature requests to GitHub Issues. Try to figure out where the issue belongs to: Is it an issue with Guard itself or with Guard::Jasmine? Please don't ask question in the issue tracker, instead join us in our Google group or on #guard (irc.freenode.net). Make sure you have study the README carefully. Make sure you run Guard with bundle exec first. Add debug information to the issue by running Guard with debug: true set in the options. Add your Guardfile and Gemfile to the issue. Make sure that the issue is reproducible with your description. Make sure your patches are well tested. Update the CHANGELOG for noteworthy changes. Commit directly onto the master branch only for typos, improvements to the readme and documentation (please add [ci skip] to the commit message). 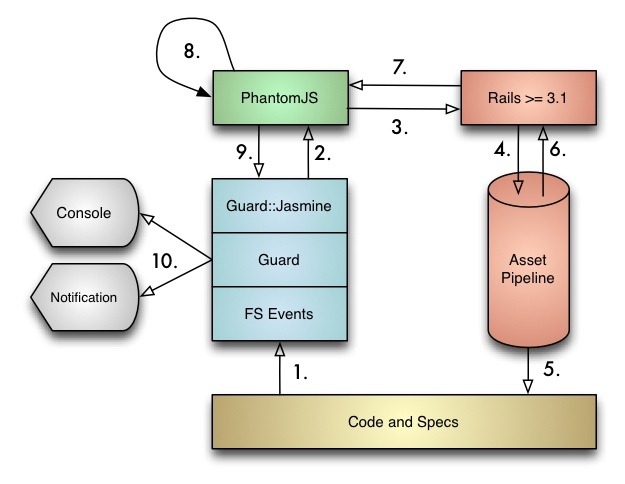 This Guard comes with a small executable guard-jasmine-debug that can be used to run the Jasmine test runner on PhantomJS and see the JSON result that gets evaluated by Guard::Jasmine. This comes handy when there is an issue with your specs and you want to see the output of the PhantomJS script. Developed by Michael Kessler, sponsored by FlinkFinger. If you like Guard::Jasmine, you can watch the repository at GitHub. See the CHANGELOG and the GitHub list of contributors. Ariya Hidayat for PhantomJS, a powerful headless WebKit browser. Brad Phelan for Jasminerice, an elegant solution for Jasmine in the Rails 3.1 asset pipeline. The Guard Team for giving us such a nice piece of software that is so easy to extend, one has to make a plugin for it! All the authors of the numerous Guards available for making the Guard ecosystem so much growing and comprehensive. Generated on Wed Apr 10 06:32:39 2019 by yard 0.9.19 (ruby-2.5.1).